The stuff has been around since before most of us can remember, but in fact somebody had to invent Velcro. It was once a product so wonderful, clever, and new that it warranted a feature page in the 1958 Sears Christmas Wishbook. In 1958, Velcro – original, not-yet-trademarked Velcro – was hot technology just invented in England and who knows how many ways it could be used? Sears saw it replacing buttons and zippers… and so presented four very modern-looking men’s outdoor jackets: one iridescent, one reversible, one apparently with Velcro pockets, and one “Nylon Cardigan”, all hand washable. 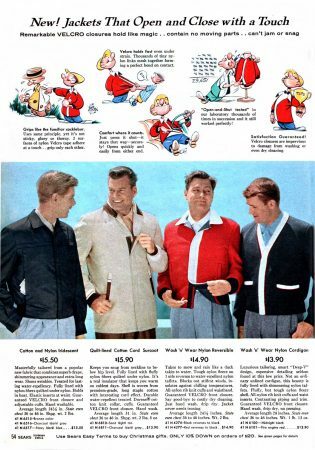 What I particularly love about this is not just how they’ve posed the models to show off the way the jackets peel apart, but that they also hired a nationally-known cartoonist to explain Velcro – how it’s not “sticky, gluey, or thorny” and was laboratory-tested thousands of times. Zoom in to read the Velcro story. And now, 60 years on, the Velcro Companies have been forced to post a cute music video https://www.youtube.com/watch?v=rRi8LptvFZY pleading that we stop calling every old hook-and-loop fastener “Velcro” and also remember, please, that it once was a brand which people were extraordinarily proud of, this space-age fastener that “contains no moving parts.” It’s not just for men’s jackets anymore.